I may be missing something obvious, but if the new timetable is crap, why not reinstate the old one instead of adopting an interim one with fewer trains? Because of the knock-on impacts to other operators. As part of the moves almost every other operator has had to change the timings of trains, with knock-on effects to shift patterns / stock availability and location etc. Take Northern. Their changes will have meant changes to Virgin West Coast at Manchester, Liverpool and potentially every station up into Scotland. East Coast will have had to reschedule at Peterborough to accommodate Thameslink, Cross Country and East Anglia for Cambridge. These knock on effects might then influence other operators too. Privatise the profit, nationalise the debt. Sounds familiar. Grayling trying to steer the attention away from Johnson and onto Corbyn this morning, and getting (eventually) slapped down by Mishal Husain for it. https://www.bbc.co.uk/programmes/b0bf4cjt - the interview starts at 2:10:12 in. The diversionary tactics start at 2:20:10. Grayling: "Well, could you suggest anything?" I went to the same school as Grayling; I’m sure they’re hugely proud of him though secretly embarrassed by his lack of critical thinking and ability. Critics accused the government of smuggling out bad news before the return of parliament – and questioned why Crossrail executives had been rewarded with new jobs. Perhaps the Mods could close all but the Brexit Fuckwit topic. The rest seem redundant. Last edited by Big Arnold on Sat Jan 12, 2019 11:03 pm, edited 2 times in total. Gutter politics indeed. 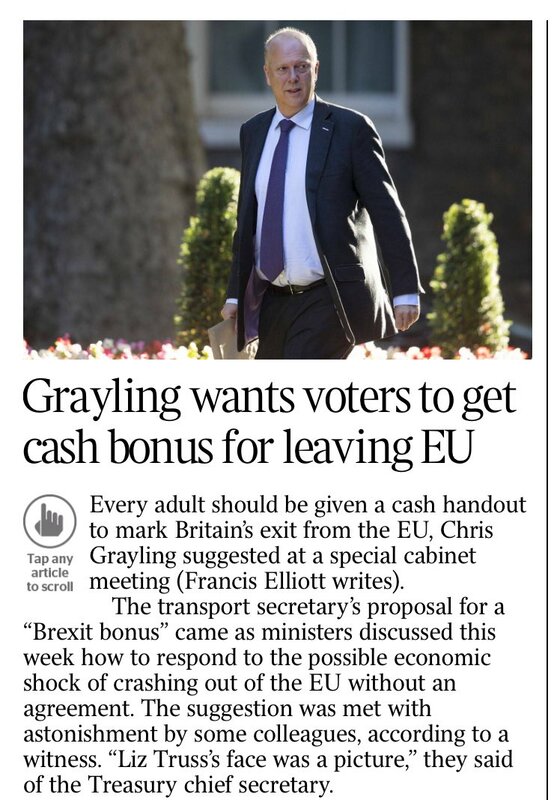 Transparently, by warning of violence in response to a measured and rational decision to hold a final say referendum, or even as a result of same to cancel the Brexit madness, Grayling is tacitly and cynically suggesting to putative Thomas Mairs out there that it is something they might like to consider. It's as if he's saying, gangster-like : "Beautiful house you have here. Be a shame if anything was to happen to it....."